ICTBroadcast has a global set of configurations that customizes the overall system behavior. Administrators of the system can customize these settings. 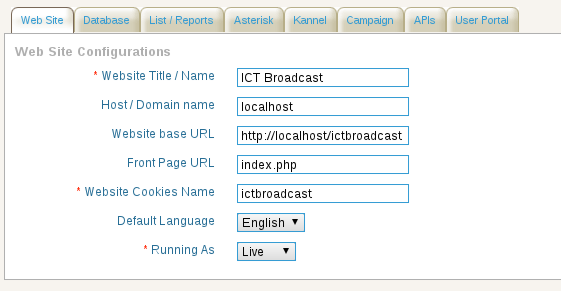 Some of the these options are overall system specific like Database, Asterisk and Kannel settings. default language for the system. Reports related options allow administrators to set items per page that are displayed in a list at a time (pagination), and the amount of precision while showing currency or amount. 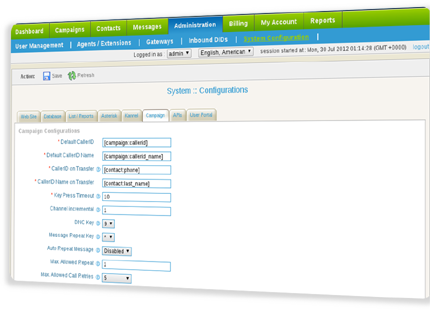 There is also a Campaign specific configuration area that allows administrators to set default Caller ID, Caller ID Name, Channels increment, DNC key, message replay key and many more. Some of these configurations can be overridden by User in User configurations.